We have a long-standing interest in the further development of supported lipid bilayers as models of biological membranes. Having pioneered supported membranes in the 1980s, we developed methods to prepare single planar lipid bilayers on soft polymer cushions. Several integral membrane proteins have been shown to be laterally mobile in these model membranes. Their motions and interactions can be studied by single-molecule total internal reflection fluorescence microscopy (TIRFM), by fluorescence recovery after photobleaching (FRAP), and by fluorescence interference contrast (FLIC) microscopy. This system is also very useful to study the assembly and dynamics of lateral membrane domains, “lipid rafts” . 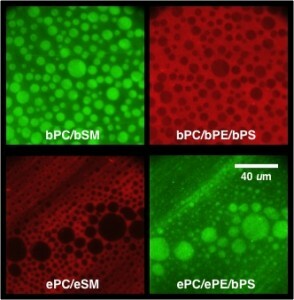 For example, we recently discovered that, in asymmetric bilayers, raft-like lipid domains are induced in inner leaflet lipid mixtures by raft-like lipid domains in outer leaflet mixtures in asymmetric bilayers. We currently study the targeting of proteins described in our other research areas to different domains in these heterogeneous membrane models. Design of a tethered polymer-supported lipid bilayer. Coupled asymmetric lipid membrane domains with 20% cholesterol in both leaflets.